The Love Lettering Project has been featured nationally with features on CBC Television’s The National, Global National News, CTV’s Canada AM, The Toronto Star, Toronto Life, The Globe and Mail and CBC Radio’s Definitely Not the Opera and World Report. (More press details here). Imagine finding a random love letter on the street – just for you (whoever you may be). That’s the kind of surprise Lindsay Zier-Vogel set out to create with her Love Lettering Project. Sook-Yin will join her to distribute some letters for unsuspecting strangers. It reads like a chart drawn especially for you by a friend who wants only the best bacon, waffles and huevos rancheros for you and your A.M. stomach. Read the whole dittie here. When she’s not busy writing love letters, dancing or teaching, Toronto artist Lindsay Zier-Vogel creates beautifully-printed brunch maps. Complete with a checklist and button, you can guess what we spend our weekends doing! We sat down with Lindsay for a brief chat about her work + what she’d order for her perfect brunch. “In February, Toronto can be a little dire, a little grey, not so lovely at times,” says author Lindsay Zier-Vogel. 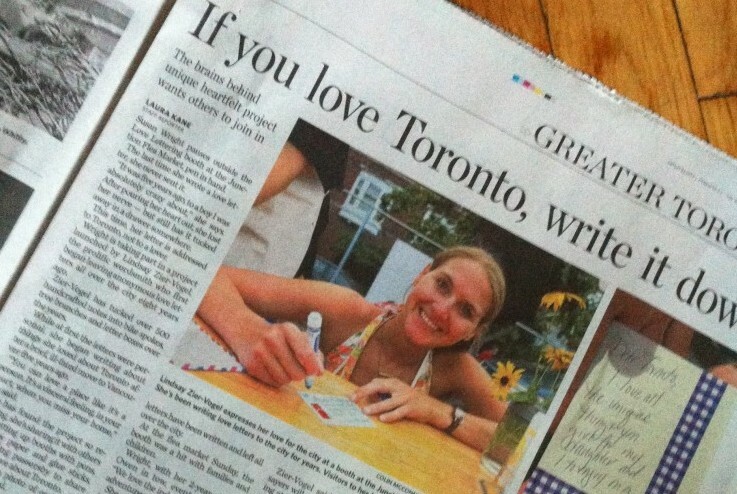 “I kind of needed to remember what I loved about the city.” So she sent out a call to people, asking them what they loved about Toronto. Her inbox flooded with responses. More about the literary journal here. “Artist pens love poems to the city, and leaves them for others to find.” There’re even poems on the fourth page! The result is 65 original poems that have become 500 art pieces, which she slips into airmail envelopes and leaves all around the city. “I just like putting them out in the universe,” she said. Delmar @ Night: Dan Delmar chatted with Lindsay Zier-Vogel about The Love Lettering Project on Montreal’s News Talk Radio Station 800 AM. A wonderful podcast with JP and Elah about the Love Lettering Project. See the whole image interview here. More Love Lettering Project love! …So if you’re lucky enough to spot a red-and-blue envelope dangling from a tree or taking up a subway seat, open it and find another reason — care of Zier-Vogel — to love your city. Spring has finally sprung and all over the city, the feeling of positivity and optimism can’t help but feel contagious. Lindsay collects stories from friends and strangers that follow a specific theme; whether it be the location of someone’s first kiss, or their favourite restaurant in the city, people share with her what they LOVE about Toronto. She then crafts these stories into unique, 1 of a kind love letters and poems, and places them randomly throughout the city (or exactly in the place the story came from) for an unassuming stranger to happen upon. She’s tied them to trees in the park, stuck them in baskets of berries in the market, hidden notes between pages of novels in the library, anywhere you would least expect to find “love”. Open Source Movie short film of Lindsay Zier-Vogel’s exhibition of handmade books. Produced by David Tse. Edith and Eliza, choreographed by Susan Kendal and Lindsay Zier-Vogel and danced solo by Kendal, was driven by subdued sounds interspersed with fractured samples of text by Zier-Vogel. In its delicious fusion of poetry with motion, Edith and Eliza used the wartime experiences of its titular characters to examine the triumph of womanly strength and sensuality over anxiety and restriction. WEAR YOUR WORDS: Toronto costume designer and Susan Kendal and poet/dancer Lindsay Zier Vogel worked so well together combining their talents in the world of dance, they decided to join forces in the world of fashion as well.The result is the Puddles in Their Pockets clothing line of summer tops, napkins and pillows, distinctive for pretty patterns and for the poems silkscreened on.